1997’s GOOD WILL HUNTING was the story of a genius with a tragic backstory played by Matt Damon. His future was the source of anxiety for those around him. While the well-meaning psychologist - played by Robin Williams - only wants Damon’s character to find happiness, the M.I.T. professor - played by Stellan Skarsgård - wants Damon to become a great academic mind and achieve full potential. And then there’s a motley crew that surrounds Damon. GIFTED replaces Damon with a brilliant 6 year old girl, Mary (Mckenna Grace). Robin Williams is replaced with a caring Uncle, Frank (Chris Evans). Rather than Skarsgård, we have another M.I.T. academic (this time it’s Grandmother Evelyn played by Lindsay Duncan). Instead of a motley crew, Mary has support from loving neighbor Roberta (Octavia Spencer), school-teacher Bonnie (Jenny Slate) and the most adorable one-eyed cat, Fred. Like Matt Damon in GOOD WILL HUNTING, Mary’s backstory is defined by tragedy. She’s never met her biological father, and her mother committed suicide during her first year of life. Mary comes from a long line of gifted individuals (her mother was noted for being one of the most highly-regarded minds during her life), and her grandmother is well-respected within M.I.T. Through the tragedy of Mary’s short life, the one person who has supported her and took custody of Mary is her uncle, Frank. Fred the cat has also been there for her along the way. Frank wants Mary to live a normal life and interact with her peers on an age appropriate level. He will not consider a gifted school or alternative way of life for Mary. This presents the most amusing scenes in the film which have Mary going toe to toe with elementary school teachers, principals and bullies. All of this to the dismay of Grandmother Evelyn who believes her granddaughter should be living a life of a young genius. Mary not only blows away her kindergarten teacher with her mathematical skills, but respected M.I.T. professors. A custody battle ensues for Mary. Will she stay in Florida and live a low key life with Uncle Frank? Or will the court agree to have her live with her grandmother in Boston? Frank worries that this is the same path his now deceased sister traveled down and that Mary deserves to be a kid. Director Marc Webb (THE AMAZING SPIDER-MAN, 500 DAYS OF SUMMER) delivers a pretty sweet and accessible film. The problem in GIFTED is that, for as unique as Mary is, the film feels unoriginal and predictable. There isn’t a bad performance in the film. Young Mckenna Grace is sure to please audiences with her performance, striking the perfect balance of smart, cute and funny as Mary. Lindsay Duncan is pretty unlikable as grandma (I mean this as a compliment), while Chris Evans plays it cool. Even still, the film sports some half-developed roles and storylines. Octavia Spencer as Roberta is a fun treat, but her part feels odd and half thought out - not quite deserving of the actress who fills the role. The movie also presents a possible love story that ultimately leads nowhere. 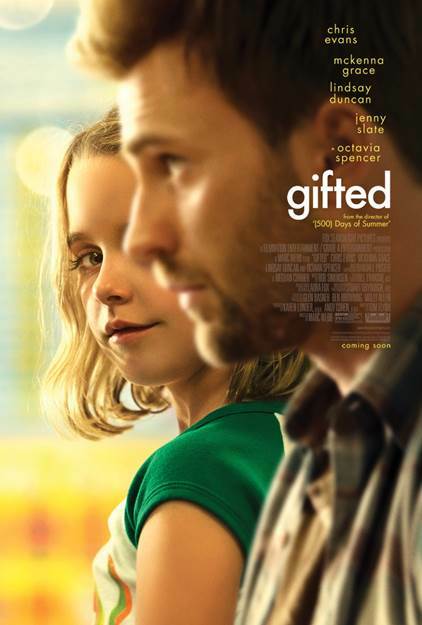 It’s not always necessary that a film give you something to walk away with, but still, GIFTED feels like it comes up a bit short.